Goal #1: Building a welcoming, engaging and inclusive community that creates a sense of belonging for the students. Offer curricular and co-curricular activities in conjunction with academic partners, creating a seamless learning environment. Integrate themes of leadership and justice and diversity into the core of all student engagement activities. The skills we need to be successful as students are the same skills required of successful employees and entrepreneurs in today’s global, digitally-driven workplace. 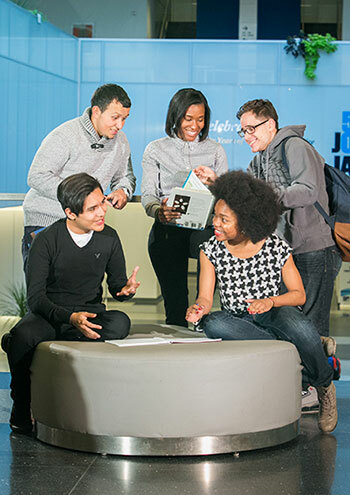 The Division of Student Affairs at John Jay College has identified five Essential Skills, based on national research into employers’ thoughts on college students as well as John Jay College’s mission “Educating for Justice.” These Essential Skills – Communication, Critical Thinking, Leadership & Teamwork, Social Justice & Civility, and Healthy Living – frame the services and programs provided through the Division of Student Affairs. The Essential Skills project in the Division of Student Affairs encompasses three activities: the calibration of all Student Affairs departments’ learning outcomes and activities to the five skill areas, assisting students in recognizing and building their competencies in these five skill areas, and validating and credentialing competency for individual students. Essential Skills Team: Lynette Cook-Francis, Vice President of Student Affairs; Danielle Officer, Center for Student Involvement and Leadership; Rosann Santos-Elliott, Strategic Initiatives; Michael Sachs, Assistant Vice President/Dean of Students; Will Simpkins, Center for Career and Professional Development.